When Gove was elected in 2010 the first piece of legislation rushed through Parliament allowed for the creation of ‘Free’ Schools alongside the acceleration of the Academies programme. 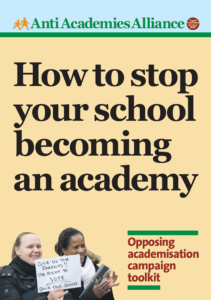 From the outset education campaigners argued that this was a potentially devastating development – undermining existing schools, breaking up local democratic accountability, destroying teacher’s terms & conditions, the list goes on and on. Discovery New School the first to be closed. Discovery New School (DNS) in Crawley, West Sussex, has been ordered to close its doors on April 4. It was one of the first 24 ‘free’ schools to open in 2011. In a damning letter to the school’s chairman of governors, Chris Cook, Schools Minister Lord Nash said he was ending its funding agreement. Discovery New School was declared failing and placed in special measures by the education watchdog Ofsted in May. A Department for Education (DfE) spokesman said it had been monitoring the school’s progress and found it was not making the changes needed to improve standards. Lord Nash’s letter said that during a visit to Discovery New School last month, Ofsted found that “no progress in the quality of teaching and learning had been made since the original special measures judgement in May”. An Ofsted report declares that the Al-Madinah Islamic school in Derby is “in chaos” and has “not been adequately monitored or supported”. The report says teachers at the faith school are inexperienced and have not been provided with proper training. Pupils are given the same work “regardless of their different abilities” and the governing body is “ineffective”, according to the report which was commissioned amid reports of irregularities at the school. Annaliese Briggs was appointed principal of Pimlico primary in central London in March by a charity set up by a government minister. She had no teaching qualifications and little experience in running a school. The new free school is sponsored by the Future Academies charity set up by Lord Nash, a junior schools minister and one of Michael Gove‘s closest allies. Briggs, an English literature graduate from Queen Mary, University of London, had worked as a junior member of staff at the rightwing thinktank Civitas. She had no qualifications when appointed but was reportedly trained in Wandsworth in preparation for the beginning of the school year. She said that she would ignore the national curriculum and teach lessons “inspired by the tried and tested methods of ED Hirsch Jr”, the controversial American academic behind what he calls “content-rich” learning. She quit after 6 months. Sources close to the academy say she was finding it difficult to cope with the workload. Sherry Zand the Principal of IES Breckland School in Brandon Suffolk resigned in November. This comes weeks after Zand fired six teachers at IES Breckland who had only been appointed in September. Since the start of the school year nearly a third of the teaching staff have left IES. Things apparently got so bad at the school that Zand herself was roped in to teach English before she went on sick leave. IES English Schools Ltd who run IES Breckland under the only profit making agreement to run a free school currently in place have moved fast to bring in their own UK Chairman and Chief Operating Officer Peter Fyles as Acting Principal. Fyles is quoted by BrandonSuffolk.com as saying in a letter to parents that the search for a new permanent principal is already underway and that they would be looking for an experienced principal to take the school forward. His choice of words is interesting as Zand had never been a Head or Deputy prior to her appointment at IES. It looks like they intend to ensure her replacement has more experience. The Nishkam school failed its Ofsted inspection in July. It rated Nishkam Primary as ‘requiring improvement’ in all of the main areas – achievement of pupils, quality of teaching, behaviour and safety of pupils, and leadership and management. The report concluded that the school needed to raise standards because ‘there is not enough teaching which is good enough to enable pupils to learn as quickly as they should’. Inspectors were also critical of the school’s leadership, saying leaders and governors did not have a clear understanding of the school’s strengths and weaknesses. OFSTED has been drawn into the row over a scandal hit free school facing fraud allegations as an MP has demanded to know why a Government probe into financial irregularities there was not mentioned in an inspection report. MP David Ward has criticised Ofsted for not mentioning the investigation into the Kings Science Academy, in Bradford, despite the education watchdog being aware of it when it inspected the school. The free school has been in the spotlight since a leaked report revealed that the Department for Education (DfE) had found it had submitted fabricated invoices to the Government to claim just over £10,000 in public money. The government’s flagship free school programme will cost at least three times the sum originally allocated, the public spending watchdog has found. The National Audit Office said the scheme allowing groups to set up state-funded schools would cost £1.5bn – the original Treasury grant was £450. The report also confirms that despite intense pressure on school places in some areas, many free schools have opened in parts of the country with no places pressure. More than a quarter of all spending on school buildings – £241m out of £950m – has been on free schools in areas with no need for extra places forecast, the report says. According to new figures from Ofsted, free schools are actually underperforming compared to all schools inspected by the regulator. This is particularly incredible since ‘free’ schools can select their location, premises, staff and pupils. For ‘free’ schools to perform worse than existing schools is an indictment of the policy. A recent FOI request has shown that some ‘free’ schools are employing large numbers of unqualified teachers. Trinity School in Sevenoaks, Kent, which opened in September 2013, said seven of its nine teachers were unqualified. At Discovery New School in Crawley, West Sussex, which was ordered to close its doors on April 4 earlier this month (DEC), five of the school’s seven teachers were unqualified, the figures showed. Employing unqualified teachers is one of the ‘freedoms’ that Michael Gove has encouraged. We have been proven right. Here at the Anti Academies Alliance we have no crystal ball. But as a coalition of education trade unionists, councillors, campaigners and parents we know something about how our schools should be run, and it’s not like this. Michael Gove and his education experiment have to go. This entry was posted in News, Research and tagged Free Schools, Gove, Ofsted. Bookmark the permalink. I have worked with my colleague Christine Townsend for a year or so, and she is a respected local campaigner, who also ran as an Independent for the Bristol city council elections in May 2013. I have sent her comment above to the Times Educational Supplement.It remains to be seen if any journalists have the tenacity and the intelligence required to take this up. I confess to being neutral on the subject of free schools, but clearly what Christine has uncovered about certain Schools admission policies in Bristol has huge implications regarding wether we want our taxpayers money to be spent in our State education system in ways that appear to be discriminatory in favour of parents in certain income brackets. Bristol seems to be leading the way in allowing a free school to take over space in its much-loved Bristol Central Library, setting a dangerous precident. However, the plans have opened up Cathedral Primary School to scrutiny, exposing some of its poor practices and revealing a lack of knowledge about Equal Opportunities. 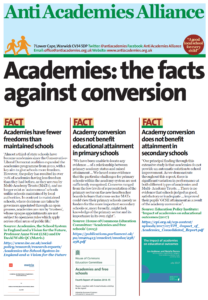 We need to fight back against Free Schools and the propaganda swirling round them. Your final comment about governance rings very true for a campaign I have become closely involved with in Bristol with regards the proposal to open a primary Free School in the centre of our city. This summer I read press reports about a proposal that would see a new Free School open in part of Bristol’s historic Grade 1 listed central library in the heart of our city. This building was donated to the people of the city as a library space in 1904 and has provided a nationally recognised service to people of all backgrounds since. The proposal seeks to use the basement areas described as ‘book storage’ of this publically owned building for a Secretary of State approved primary Free School – The Cathedral Primary School is to be a 420 place feeder to the secondary Academy, The Bristol Cathedral Choir School. Until 2008 this secondary school had been a fee-paying independent school and it along with Colston Girl’s School was the first fee-paying school to come into the state sector as Academies under the previous Labour government. This means that the governing bodies of these secondary schools have never experienced life within the local authority fold. Now the Cathedral Choir School is seeking to use the funding from the Free School programme (on top of a programme of expansion and capital investment under Building Schools for the Future secured as an Academy) to expand its provision into the primary sector. As a Bristolian, experienced state sector teacher of 15 years, 10 in Bristol, experienced school governor, community governance member, co-founder and trustee with local and national 3rd sector organisations I was interested in the educational ‘vision’ this school would offer the children and young people of our city. So I started to do some research into the current and more recently historical governance of these primary and secondary schools – the Executive Principal and some members of the governing body of the secondary are the very same people overseeing the establishment of the primary and indeed these schools share a Chair who was also the Chair of the governing body during the fee-paying school converting to an Academy. What I have discovered has shocked me to the core and is what I can only describe as one of the biggest scandals yet to hit the press regarding the direction of state education in our country. The first thing that struck me when I first read the article was the ‘vision’ that this school held to serve 3 local authority areas – Bristol, North Somerset and South Gloucestershire. My immediate responses were why would a primary in the centre of a city seek to take 4 year olds from 3 local authorities? How this school would was to be ‘open to all’ as were the claims and who pays for the transport enabling the claim to be tue? How can a school claim to ‘serve the whole city’ when in reality the only families in a position to attend this school will either live within walking distance or be in a position to fund the transport. The Bristol City Council composite prospectus warns parents to think carefully of the costs of choosing a school that sees the need for them to transport their child on a daily basis, averaging the annual costs for using a car to be £930. The annual cost in Bristol of a bus pass for an adult and a child in Zone 1 of the city is £975. Who then in reality would be in a position to consider this school for their child? I started to ask the school, via social media, some questions relating to transport costs but got nowhere and was largely ignored. I raised this with our elected Mayor, George Ferguson who directed Craig Bolt a senior education manager in the local authority to deal with the concerns raised in emails. Bolt confirmed that transport costs would not be covered by the council, the Bristol education transport policy has been stripped to the bone covering children with statements, those attending church schools on free school meals and those whose allocated place exceeds the statutory walking distance for a child of primary age. During this time I was also raising my concerns about the realities of this provision with local Councillors on the Children and Young People’s Scrutiny Panel, my ward Councillor Simon Cook, other elected Councillors in disadvantaged wards for whom this school would not be an option for their residents, my local MP for Bristol West Stephen Williams Liberal Democrat and the Prospective Labour Parliamentary Candidate for Bristol West Thangham Debonaire. No one was interested. At this point I wrote a formal letter of complaint to the Executive Principal, Neil Blundel and the Chair of Governors Stephen Parsons about the conduct of this inappropriate external communication, quoting extracts from their Bullying and Staff Code of Conduct policies. The response I received surprised me to say the least. The Executive Principal claimed that the school’s ‘comprehensive’ Communication Policy written in 2012 did not cover external communication ‘as such’ and named the marketing company Edge Media as the culprits for these inappropriate comments. Edge Media’s website proudly claims to have been working with Bristol Cathedral Choir School since 2008 which means when the Executive Principal and Governing body ratified their ‘comprehensive’ Communication Policy in 2012 they did so without a thought about the need to include external communications as would be normal practice for any publically funded (or otherwise) organisation providing a service to the public! Further research in relation to the secondary school and how the cohort had changed (or otherwise) since becoming a state funded Academy also led me to ask for copies of the school’s policies in relation to equalities and for the details of how it had spent it’s Pupil Premium funding as this was not available on the website (at this time, since been added) despite this being a statutory requirement. These policies dated from 2008 when the then fee-paying school came into the state sector and had not been looked at since – the Executive Principal did point out however that they were due to be reviewed that very next month (Dec 2013) which was very timely I thought! What this meant then from a governance perspective was that the school’s policies relating to equalities had not been a consideration for the governing body when seeking to establish a new primary school. It also meant that no one in a position of governance had considered the need for policies to be re-visited in light of the Equalities Act 2010 and on top of this no one on the governing body realised or thought the need for such policies to be reviewed according to the statutory review schedules for all policies relating to equalities – that of 4 years, having missed this requirement by a whopping 18 months. This was the first of several communications with those running this ‘family’ of schools. Using the school’s education consultant to oversee the random allocation of places in this way is neither independent nor a body and this has led me to put in a second FOI request of the secondary school to investigate the historical practices of the governance of this place allocation since 2008. It is interesting to add that in order for the Executive Principal to publish this response on the website (as opposed to the letter he sent me) as is his legal duty; I needed to refer to the Information Commissioner and make it clear I would escalate this response if he chose not to. On top of this at some point the secondary school as also added further very specific postcodes to their ‘random allocation’ place reserve that include 3 postcodes in Gloucestershire and a postcode in Wiltshire – none of these additional postcodes are in that original Funding Agreement and would have also needed that prior consultation in order for the Department of Education to agree to the changes – senior education managers are also investigating the addition of these postcodes. Remember the other independent school that came into the state sector at the same time as the Bristol Cathedral Choir School that of Colston Girl’s? This school also has added these exact same postcodes to the ‘random allocation’ area for place allocation also not in its original agreement with the Department of Education – have also asked the senior managers to explain when and what consultation took place before these were added! Again the oversubscription statement produced by the school is on the Bristol City Council website address above. Both of these secondary schools are some of the most oversubscribed in the city with 100’s of families being denied a place for their child while families from outside of the Bristol area are having places reserved and randomly allocated to them year on year. The last week of term saw both the Bristol Cathedral Choir School and the Cathedral Primary School put out their Admission Policy for formal consultation, the questions I am asking are finally beginning to force some movement in the local authority and the school but this has taken months of individual action and determination and many hours brushing up my knowledge and understanding of education law. ‘Ofsted Report: Bristol Schools now outperform many across the South West’. This led to the decision to allow the ‘book storage’ to form part of the expanding primary school to be ‘called-in’ by 2 of the local Councillors who have been supporting campaigners in their efforts to save the central library from this ex-private now academy/free school governing body. And this is where Bristol is at the moment. 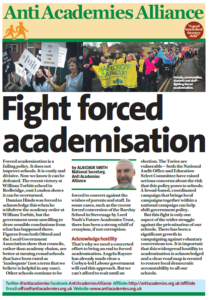 The decision has effectively been put on hold to allow for a committee of local elected Councillors to review and discuss whether this decision by our Mayor, expressly promoted by local authority senior education managers Liberal Democrat and Labour Cabinet members needs to be discussed further by all our elected representatives. As the Mayor George Ferguson has rightly pointed out this is not a ‘game changer’ and he will in the end have the final say as is the executive power of the elected Mayor. I will be putting in questions and a statement for this meeting and raising the points I have made here, others will examine the proposal from the perspective of the library service. And so this leads me on to surmise why it is that this ‘family of schools’ and Colston Girl’s school are seemingly being treated so leniently and without any sort of local scrutiny. Certainly the local authority officers have pointed out that they are their own admission’s authorities and therefore answerable to London. But why have the seemingly unlawful aspects of place allocation when the school is oversubscribed been so clearly missed by those who job it is to monitor education in our city? Year on year both of these schools have appeared to be acting outside of education law and breaking the terms of their funding agreements with the Department of Education. Those of us in Bristol who understand the ‘bigger picture’ in terms of how these schools are controlled have our own thoughts as to why this is. Bristol’s very own Mason-like organisation the Merchant Venturers have existed in Bristol for 100’s of years. Since the changes in governance of state education people in this organisation have become intrinsically linked with various secondary and primary schools in our city. Indeed Stephen Parsons the Chair of both the Cathedral Primary School and the Bristol Cathedral Choir School is a member of the Merchant Venturers. Other schools in Bristol are also associated with people in this organisation with members being either the Chair of governors or on governing bodies – the Merchant’s Academy, Colston Girl’s and various primary schools. Merchant Venturers are also involved with Bristol University, the Old Vic Theatre, local private schools, Learning Partnership West and funding organisations that give small grants to local charities working with young people. Members of the Merchant Venturers are very influential people in our city associated with legal firms, real estate, construction businesses and even a local football team Bristol City FC. These people are also clearly well connected with our local political representatives, some sharing board places on some of the above with local Councillors – could it be that local senior authority officers are so used to tipping their caps to these people that their actions as members of governing bodies on state funded schools have been met with a blind-eye? Indeed our very own elected ‘Independent’ architect and businessman Mayor George Ferguson was at one time a member of the Merchant Venturers. Any investigative journalist reading this who is interested in digging a little deeper into what appears to be a very cosy relationship please do get in touch –would be more than happy to point you in the right direction as would many other ordinary people in my city who also consider the ‘book storage’ move as a ‘step too far’. This experiment with our children’s education has nothing to do with raising education standards. It is simply political doctrine. 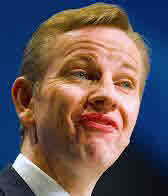 Gove will not listen to professions or allow simple facts to get in the way of his right-wing policies. A timely summary of what is fast becoming an unacceptable, expensive disaster. When austerity leads to draconian matters such as the bedroom tax, why does the Education secretary retain his job with such reckless overspending and multiple votes of no confidence? This illustrates that Governance is no longer a meaningful term for the Tories – a dictatorship is closer to the mark. Diktat by headless chickens, it seems.